So here at GroCycle we are big believers in fresh, healthy, sustainable food. Everyone in the team loves to cook and is interested in experimenting with different ways to eat well. Being relatively new I eagerly suggested we channel our interests into a food blog. This may perhaps have been a little foolish as none of my friends would ever call me a cooking expert. I also don’t have much experience with using mushrooms. Don’t get me wrong, I am in no way a mushroom hater! But they certainly weren’t my go to vegetable, despite them being such fun-guys…. [su_spacer size=”10″] But enough of the terrible puns. My intention with this blog was to test my cooking limits and to try out some great mushroom recipes so that we could recommend the best ones to ourcustomers. After all, mushrooms contain selenium, vitamin D and are a good source or iron. Plus, they’re low in calories. What’s not to love? [su_spacer size=”10″] As part of my mushroom loving crusade I managed to rope in my friend Ellie aka @ellenakatesimpson. As a food lover and photographer she has kindly agreed to take pictures of our efforts and to join me as I muddle my way through some great mushroom recipes. 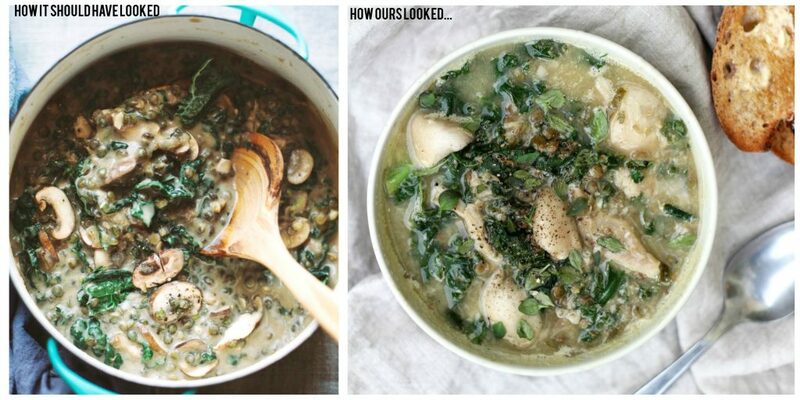 What we loved about it: Hearty, healthy (no really, there’s kale in it) and filling. The perfect winter warmer. What we didn’t love: Not as creamy as we first imagined so would try using more coconut milk than recommended. Also a little difficult to get the right texture with the lentils. Ours turned out a little watery (probably to do with not having the correct food processor). • Be careful when blending! We used a hand held blender which made things quite messy and meant the soup turned out a little watery. However, with a bit more patience I’m sure this could be avoided.